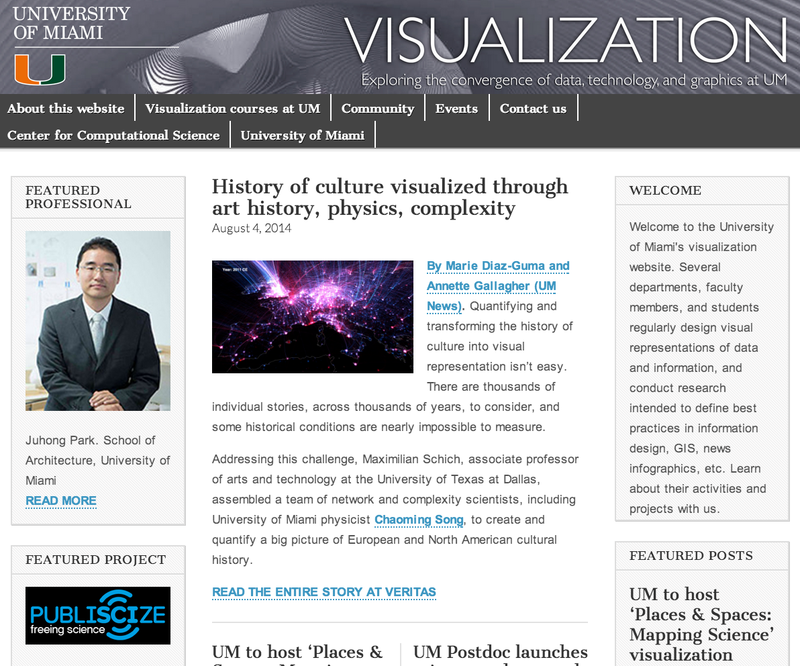 As you may remember, in January I was appointed as director of the visualization branch of the University of Miami's Center for Computational Science. My main goal so far has been to find out what people in all departments at UM are doing with visualization, information graphics, mapping, etc. It turns out it's an awful lot, which is exciting: I'll be able to help build many connections, and learn a big deal in the process. The second thing I've done is to create a new website in which, with the help of students and faculty, we'll announce events, projects, courses, etc. I've soft-launched it already. Some sections aren't done yet, but there are a few stories available already. The most important one is about the Places&Spaces visualization exhibit. We're bringing it to UM this Fall semester (read the press release) and we've organized a series of talks by renowned people in the field, such as Katy Börner, Stephen Few, Nigel Holmes, John Grimwade, etc. You can attend these lectures for free, but you'll need to sign up through the links in the story. We're also working on some very interesting new educational opportunities in data visualization and journalism. I cannot reveal anything for now, though. Stay tuned.